NFTE New England – May 21st took NFTE’s entrepreneurship course this academic year with The MET’s Certified Entrepreneurship Teacher Jodie Woodruff, NFTE New England’s 2014 Global Enterprising Educator of the Year, and presented his business plan for “Kick Vids” providing expertly done, affordable short videos for crowd funding campaigns, in front of two panels of distinguished judges at Babson College on May 20th, Noah competed against entrepreneurship students from across the Providence and Hartford region. As the Southern New England Finalist, Noah will compete in the NFTE National Youth Entrepreneurship Challenge, presented by MasterCard, next October at the Computer History Museum in Silicon Valley. The Southern New England Regional finalists represented 12 businesses, all of whom participated in the Network for Teaching Entrepreneurship (NFTE)’s program that engages and inspires young people to pursue educational opportunities and start their own businesses. Kick-Vids is a venture that taps into the fast-growing phenomenon of crowd funding. Founder Noah Salem produces videos for entrepreneurs and artists who want to raise capital by showcasing their ideas to much larger audiences, such as those who frequent Kickstarter, Indiegogo and other platforms. Kick-Vid’s point of distinction is that it charges a low flat fee for videos and collects a percentage of funds raised on successful campaigns. Kick-Vid’s success is based on its clients’ success. 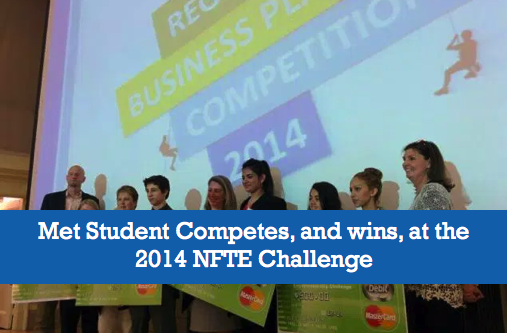 This year’s competitors were an impressive group of young people with an array of innovative business ideas. They exemplify outstanding drive, dedication and commitment as they work to get their plans in shape and even to bring products and services to market in preparation for the competition. And thanks to the support of sponsors like MasterCard, SAP, Pitney Bowes, and EY, and hosted by Babson College, the NFTE New England Challenge attracted the region’s top entrepreneurship students. The 40 judges for the day came from the entrepreneurial and education community, including entrepreneurs, business leaders and educators alike from BT, State Street, Eastern Bank, Bank of America, MindsetGo, Mobiquity, The Barbara Lynch Gruppo, Massachusetts Financial Education Collaborative, Babson College, The Boys & Girls Club, ShopAdvisor and ExtensionEngine, among others. “We are excited to have the opportunity to recognize so many amazing young entrepreneurs and guest judges from around the region for a day of learning, networking and competition,” said Program Director Dori Wolfson. All finalists were required to develop and present original business plans as part of their entrepreneurial studies at school. As part of their coursework, NFTE students receive hands-on training in launching a business and apply the real-world relevance of math, reading and writing to their businesses. The NFTE curriculum reinforces students’ critical thinking skills and provides them with tools to help them take control of their futures and think entrepreneurially.